Image caption Researchers created this computer simulation of sunlight reflecting from Beagle 2. Beagle 2, the failed British mission to Mars in 2003, came "excruciatingly close" to succeeding, a study shows. 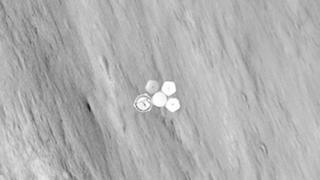 A new analysis of pictures of the Beagle 2 spacecraft shows that it did not crash-land on the Martian surface. Instead, it indicates that the landing went to plan and at least three of its four solar panels opened successfully. The analysis also suggests that the probe may even have worked for several months, but was unable to send its data back to Earth. Prof Mark Sims of Leicester University, who commissioned the study, told BBC News that there is an extremely small possibility that Beagle 2 might still be working on the Martian surface. "It may have worked for hundreds of days depending on how much dust was deposited on the solar panels and whether any dust devils were cleaning the panels - as happened with Nasa's Mars Exploration Rovers," he said. "One possibility is that it could still be working today - but it is extremely unlikely and I doubt that it is." Dr Manish Patel, of the Open University, was among the hundreds of UK scientists who worked on the Beagle 2 mission. He agrees that the new evidence suggests that Beagle 2 took lots of scientific data but was unable to send it back. "If Beagle 2 went into surface operations mode, it could have continued for some time performing the initial pre-programmed operations, happily taking data and waiting for a response from the orbiters. It turned out to be a very lonely time for the lander at the surface," he said. Those views are backed by Prof Jan-Peter Muller of the Mullard Space Science Laboratory, which is part of University College London - who has no ties with the Beagle-2 mission. "Given that (Nasa's) exploration rover Opportunity is going strong since January 2004 when it was due to last only until March 2004 and that Mars Express is going strong 13 years after orbit insertion when it was due to last only 3 years, the possibility that Beagle 2 could still be collecting data after 13 years is remotely possible." The British built Beagle 2 Spacecraft was due to land on the Martian surface on Christmas Day in 2003. The mission was charismatically led by the late Prof Colin Pillinger. The spacecraft was capable of collecting soil samples and analysing them for signs of organic molecules associated with life in a miniaturised on-board laboratory. Disappointingly, no signal was received on Christmas Day. The search for a response from Beagle 2 continued for several months but the spacecraft was never heard from again. In 2014, Nasa's Mars Reconnaissance Orbiter (MRO) found Beagle 2 on the Martian surface. The spacecraft took pictures which seemed to indicate that the spacecraft landed as planned and some of its solar panels had opened. In the new detailed analysis, Nick Higgett and his team at De Montfort University not only confirmed this but also indicated that Beagle 2 had deployed at least three of its solar panels - with the fourth and final panel possibly beginning to open. The technique is based on simulating possible configurations of the lander on the surface and comparing the amount of sunlight that reflects off the simulated lander with real pictures taken from Nasa's Mars Reconnaissance Orbiter. The researchers then identified which landing configuration of one, two, three or four solar panels opened was the best fit. "Hopefully these results help to solve a long held mystery and will benefit any future missions to Mars," said Mr Higgett. "We got so close," says Prof Sims, adding: "We succeeded in so many elements. It is a great pity the communications didn't work and we didn't get the science back." Prof Sims, who worked on Beagle 2, says that he and others who worked on the mission take satisfaction from the fact that the system did seem to work so well. "It shows that the Beagle 2 team did an amazing job. It shows that the design was sound. It got there. It landed on Mars at the first attempt." The analysis suggests that Beagle 2 fell at the very final hurdle. It was unable to send back data or receive instructions from Earth. This may have been because the fourth solar panel may have partially opened and shielded the radio antenna. Alternatively, the receiver might have malfunctioned. Another possibility is that internal electrical systems were damaged by a heavy landing. After studying the analysis, Dr Patel says he feels "incredibly frustrated" but also "incredibly proud" that the Beagle 2 team came so close. "Previously, I assumed it was in pieces. But now I feel very proud to know that it's there, intact, and was (likely) ready to do some great science," he explained. "This kind of tantalising result on a long held mystery is the kind of thing that keeps us going, that really inspires me to persist in the challenge of exploring Mars. "I like to think that in every failure there is a success hidden somewhere that teaches us and motivates us. This is a perfect example."